Some of the old time farmers had been saying that preparations ought to be made cause this looked like it would be a bad one. Of course, most of the younger guys laughed at them as they do not have the experience of the old men who had been around awhile and seen it all.Over the years the farming life has gone through a tremendous transformation you know. Large corporations set about buying up smaller family owned farms to form huge conglomerates. Not in this neck of the woods though. here, in this part of The States, there were still a handful of family owned farms handed down from generation to generation. Some sons would choose to go off to the “Big City’, but usually there was a young man or two who would stay at home and keep up with the farming. The old saying from the great World Wars still holds true, ” How you gonna’ keep em’ down on the farm after they have seen Paris “. Well, some would stay. A few would stay. Trouble was, they wanted to do it their way. Which was alright really. They were entitled to it, I guess. Bust listening to the wisdom of their elders apparently wasn’t a part of their way, especially when it came to the river.This is the river the younger fellows swam in when they were boys. they hung from an inner tube from a tractor tire and a rope, swinging into the deeper parts of the river. They would splas the girls brave enough to come down by the banks and maybe even get to toss one of those gals in once in a while. They knew a peaceful river, a friendly river. Those boys were comfortable with that river and didn’t know it’s meaner parts. The parts that would occasionally take a boy or a girl, who swam out too far or dove in to shallow where a rock or tree limb was hidden just below the water line. They hadn’t seen the effects of the warm, soft, peaceful river turned hard, cold and mean. They were sheparded home, to a safe place when the storms would rage, a twister would come through and the banks would over flow and give way to a fierce torrent of an un emotional aspect of nature that had the power to reach into their meager means os shelter and safety and take them-one by one, in pairs or in greater numbers, leaveing those left behind in confusion and despair. Today, the elders were sending out a warning that was borne from those experiences and they hoped their younger ones and sons of their old friends would drop their pride and hautiness and listen for a moment, listen for the good of all. Waters were rising now, winds blowing stronger. A few small twisters were gathering steam near by fixin’ to make a run along the banks of the river at the edge of town. Some of the young farmer fellas were talking amongst themselves and wishing they had put in some of those locks or dams that had been recommended a few years back. Too much money they said. Cut into profits, they said. They would be a big help if that water level kept rising, which it was doing. Then a few weeks ago at the local town meeting a motion had been made to at least buttress up the banks with sandbags and that would do a lot more good than it would cost. Too much work, they said. Too much effort for so little return. Rain was coming down hard now, really hard. Winds up so high that it was practically causes swells in the river. Swells, can you believe that? Water started rushing over the banks and if there was a damn in place it surely would have burst by now. It was a Sunday so, no one was working the fields and certainly not down by the river. Church had been over for more than two hours by now and most folks were in the middle of their Sunday afternoon dinner. You had Grandma Jenny, just Grandpa, Mom and Dad, little sister Julia, and Kenneth and Justice, respectively. They heard the warning siren in plenty of time. That’s plenty of time in “normal” emergency situations but these weren’t “normal” times. The alert was the old siren atop of the elementary school in the center of town. A left over from the cold war days following WW2, when it was supposed that any minute could bring Russian plane bombing the heck out of us. Well it worked now too but as they say, “too little, too late”. The “junior” twisters had grown up now and were like wild dervishes outside their doors. Howling winds were blowing around the house now as it seemed from every direction. The rivers’ waters, long since bursting over it’s banks. 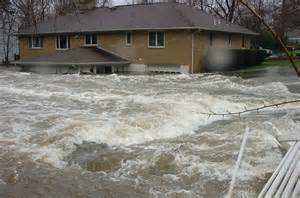 formed a rushing torrent of flooding waters that seemed to take on a life of their own and came raging against the small farm house. And the most unexpected was, the water rushing up the floors in the dinning room and the rest of the house, from the ground below. So full had the river become and so determined in seeking it’s own level, the flowing river searched every where it could, up, over, down and around and as the river flowed – it took them.